I bet I have styled hundreds of mantels in my lifetime! For every season and lots of holidays too! 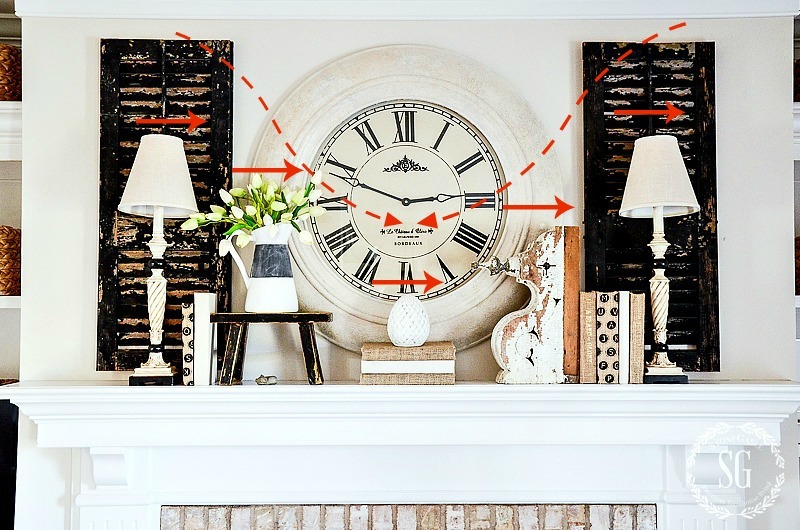 But as I get more “expert” at creating what goes on that all-important, horizontal focal point I’ve learned a few tricks that make a mantel so easy to decorate! I know just how you might be feeling… “I worked so hard at getting my mantel the way I like it I just don’t want to touch it”. I know!!!! Or how about, “mantels are so hard to decorate I don’t think I can do it”. I thought that too! 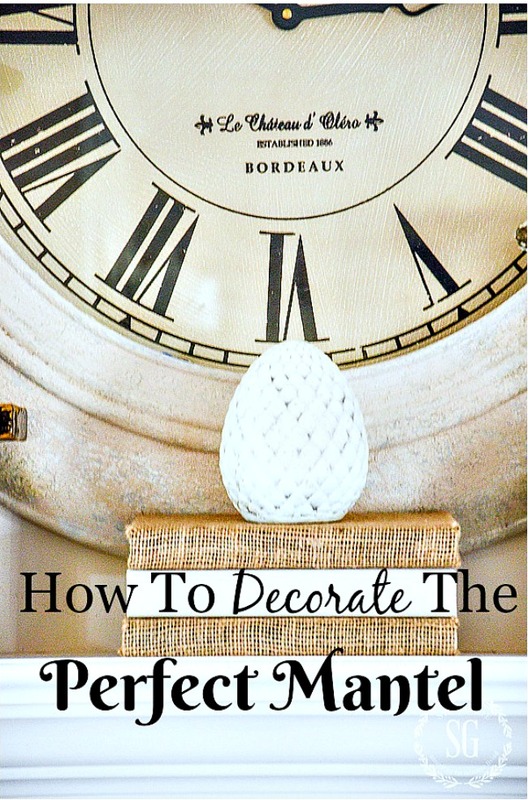 So today, I hope to give you tips to use so you can decorate the perfect mantel just right for you! We are digging through our archives and pulling out some of our reader favorite posts. This one is a Pinterest favorite! 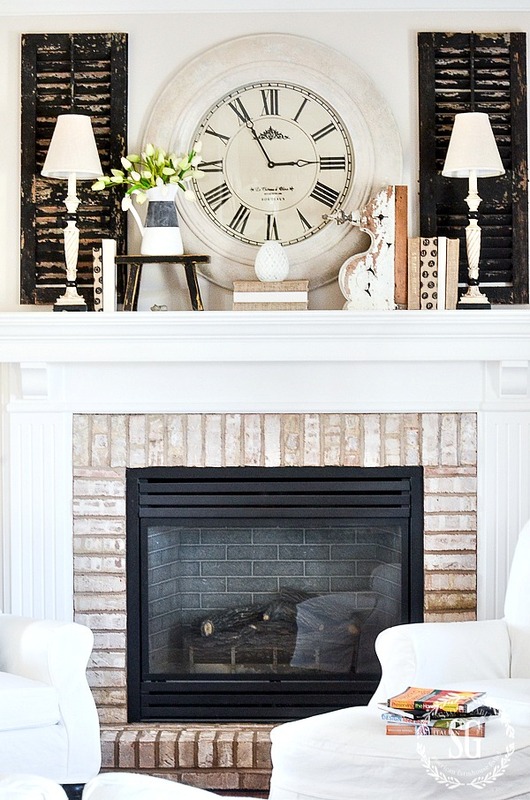 This mantel really exudes StoneGable’s casual, chippy, love of neutrals style. It was then, after hundreds and hundreds of decorated mantels that I found what I call my “mantel default setting”! To me… and let me say it again… TO ME this is the best my mantel has ever looked. It may not look that way to you but it says “StoneGable”! And isn’t it all about finding what works for us and our own unique style? 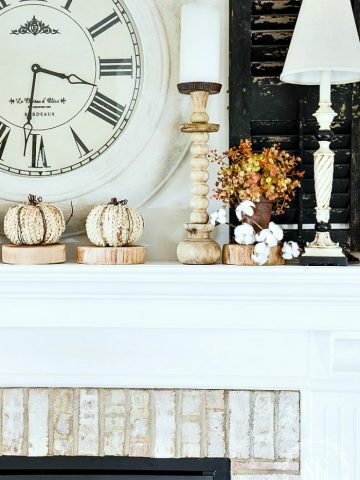 Here’s the great thing about finding a “mantel default setting”, you can keep many of the elements the same and change out just a few things when you need a season change! I know mantels can be so difficult to decorate! Just look at how narrow my mantel is! Just a book wide! And it’s long too! 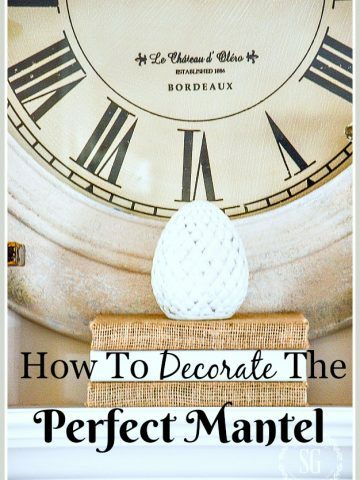 But I’ve come up with some easy tips for finding your perfect “mantel default setting” just like I did! And once you have found it changing it up a little will be a breeze! 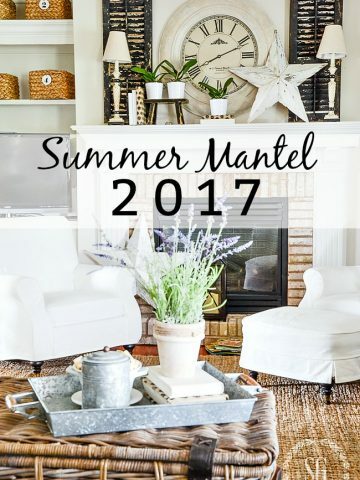 So let’s get started and find the perfect mantel decor for you! I must say… it might take some thinking and adding and editing over and over to get a look you love. But oh, it’s so worth it! My best advice is “know thyself”! You really need to know what you love and what you can look at and live with every day. Don’t put one thing on your mantel because it is trendy or so and so loves it. Only put things YOU love on your mantel! Layering is one key to an interesting mantel. Even though my mantel is very narrow I still can layer decor by hanging things on the wall. 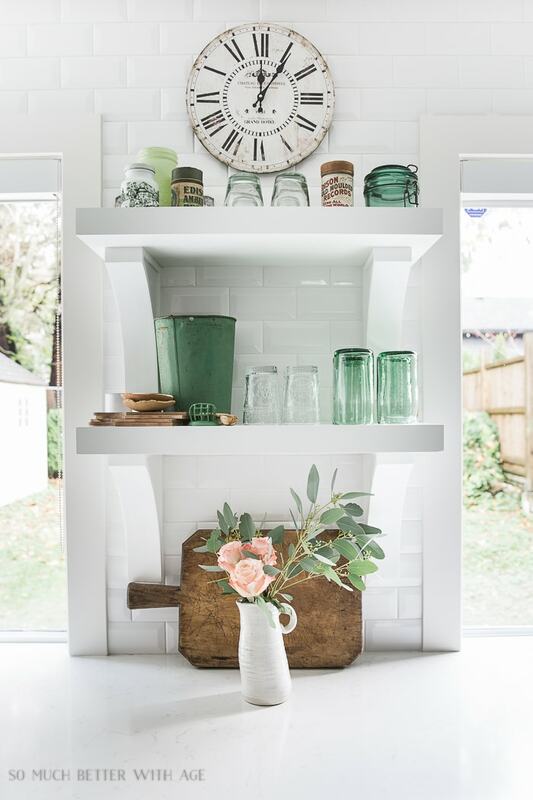 The repainted clock was hung in the middle of the mantel wall with two chippy vintage shutter flanking it on each side. This gives the mantel space a great background and fills up the blank wall space between the mantel and the ceiling. 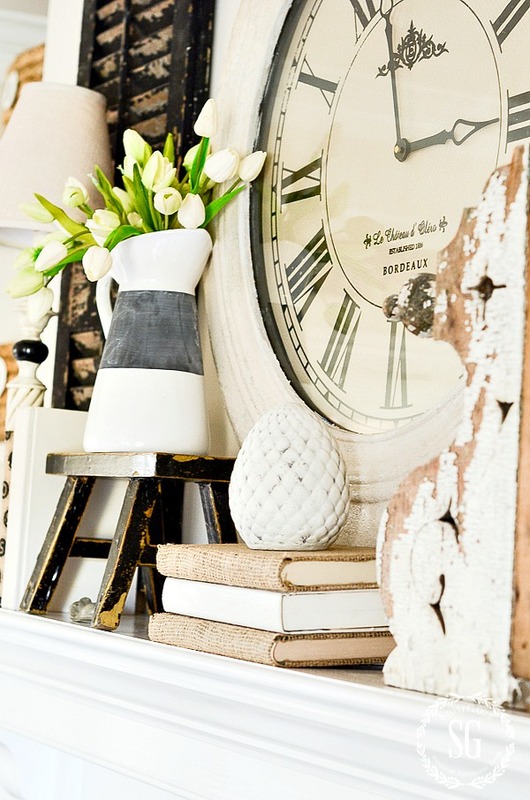 The layered items against the wall should be the tallest things you use on your mantel. If your mantel looks a bit uninteresting try putting something on the wall as a back layer. The layered items against the wall should be the tallest things you use on your mantel. Think carefully about what you hang or lean as the background layer of your mantel. I don’t recommend a mirror if your mantel is tall like mine. We had a gorgeous mirror leaning on the mantel for years until it dawned on my that all the mirror was reflecting was the ceiling. Not very pleasing! Choose something that you love looking at! Curated items should be layered in front of the taller background items. Again, be very careful about what you are putting on your mantel. The items should look collected and work well together. The family room at StoneGable is casual and used very hard! So I wanted the mantel to be casual too. 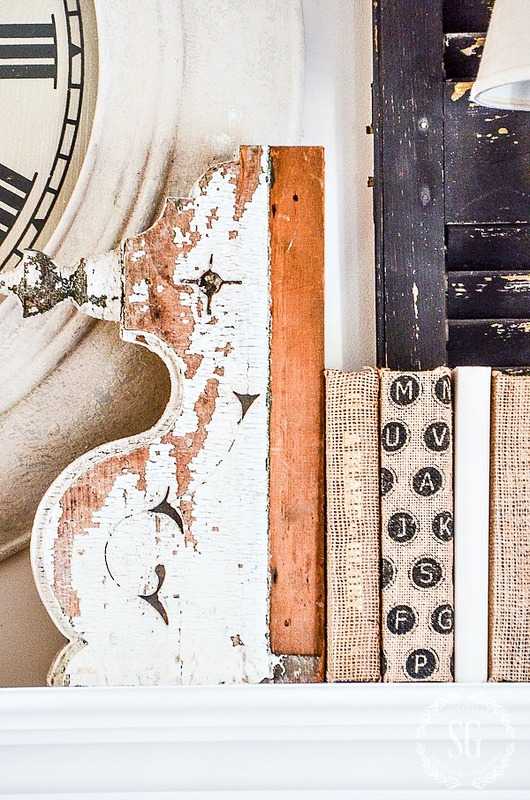 The mantel reflects my love for time-worn, one-of-a-kind pieces as well as burlap and books. Another way to make things on a mantel work together is to repeat elements. Don’t go for matchy-matchy but find ways to subtly repeat the same or almost the same things you are using to decorate. On my mantel, the color palette is tight and is repeated over and over. There are chippy elements all over the mantel. And the shutters, lamps, and books are repeated too. This is such a subtle way to make a collection of items on a mantel look like they belong together. Don’t stuff your mantel full of tchotchkes from end to end. Leave some empty space. Our eyes need to rest. So the ends of my mantel are empty and there is space between elements of the mantel. You might want to study what I have in each of the sections. Section 2 and 3 are balanced but not exactly symmetrically. This style is so easy on the eyes! Section 1, in the middle, is different but because of the repeated element of books works with the other two sections. Varying the height of things on a mantel makes it interesting! Use books and stools and cake pedestals and other objects as risers! 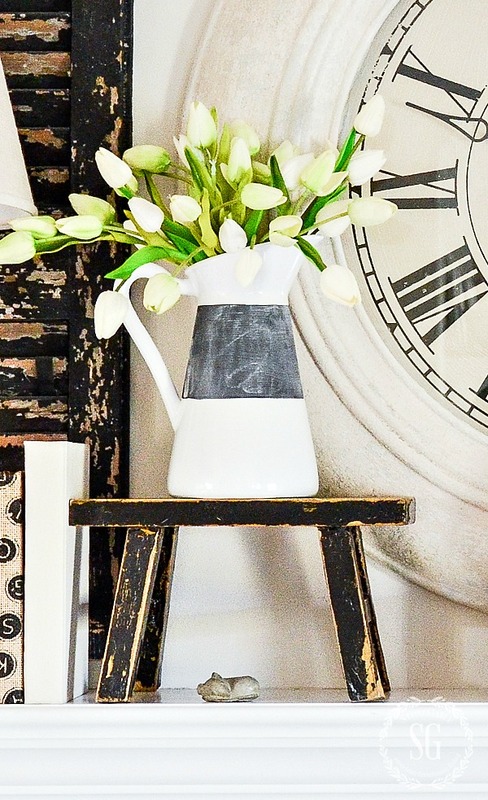 I used the little black stool to elevate the pitcher of tulips. Just think how much less interesting the mantel would be if the pitcher of tulips was sitting directly on the mantel or the stone finial was not topping off a stack of burlap covered books. The image below shows how our eyes flow over the mantel to take it in. Those dips and different heights work in amazing ways to give interest to our designs. A big decorative item is far more appealing than a gaggle of small things when it comes to decorating a mantel. Mantels are not usually looked at close up! I wonder how many of you saw our house mouse sleeping under the black stool? When we moved into our first home we found him sleeping on a kitchen window sill and he’s been with us ever since. He would literally be lost if you were standing across the room looking at the mantel! Small items look frumpy and dated and the beauty of a fireplace mantel is squandered when only little things occupy that focal space. Go big and bold. When you find that perfect combination of elements don’t be afraid to keep it fresh by changing a few things up. Why don’t you work on perfecting your mantel decorating skills and come up with a mantel that is perfect for your home and reflects your style? I’ll be freshening up this mantel for spring in early March! Stay tuned for the changes! 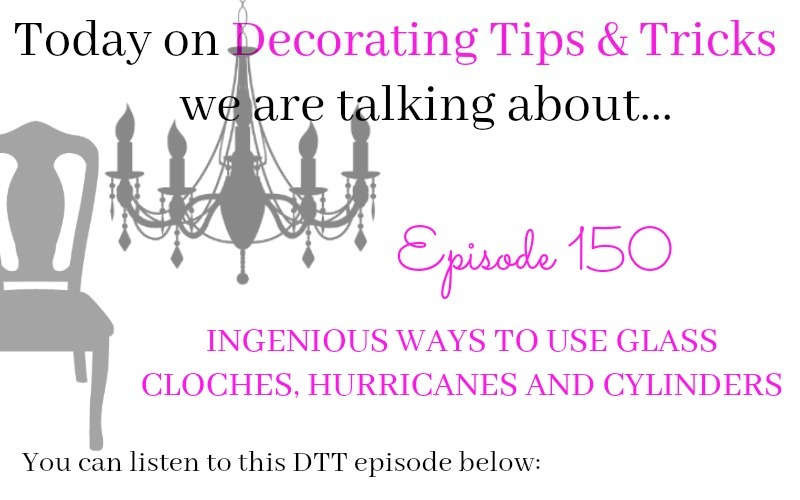 If you missed our podcast episode #8 DECORATING MANTELS you might like to listen to it. We have many other tips to help you style that perfect mantel! You can listen to any and all of the podcast and get the show notes and any links to post we are talking about HERE. 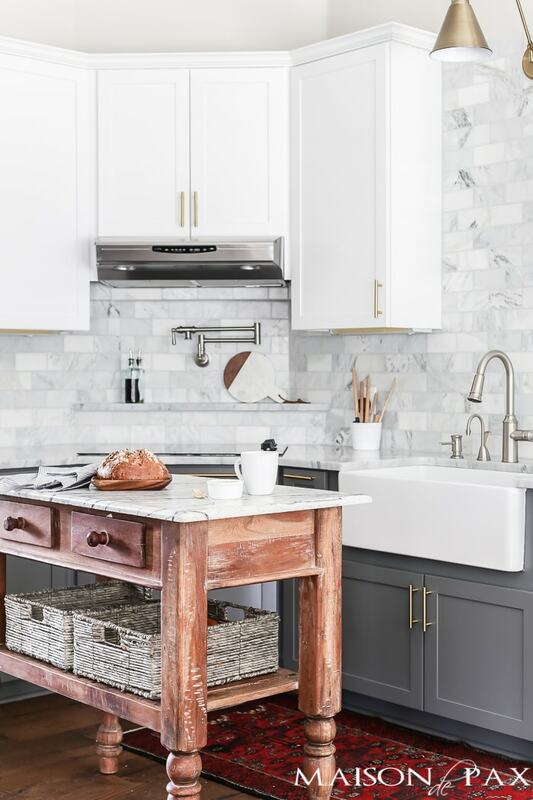 You might like to follow me on Pinterest and see all the decor I’m finding to pin every day HERE. I love love love your chair you styled today. Maybe someday I’ll get those as well. 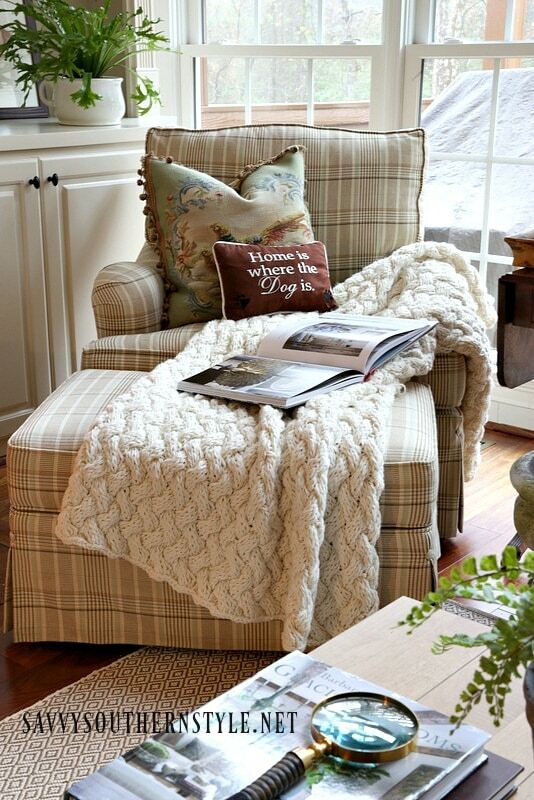 I agree that a chair usually needs something to add life to it. Thanks for all your good ideas. I’m currently working on changing out my mantle for spring. 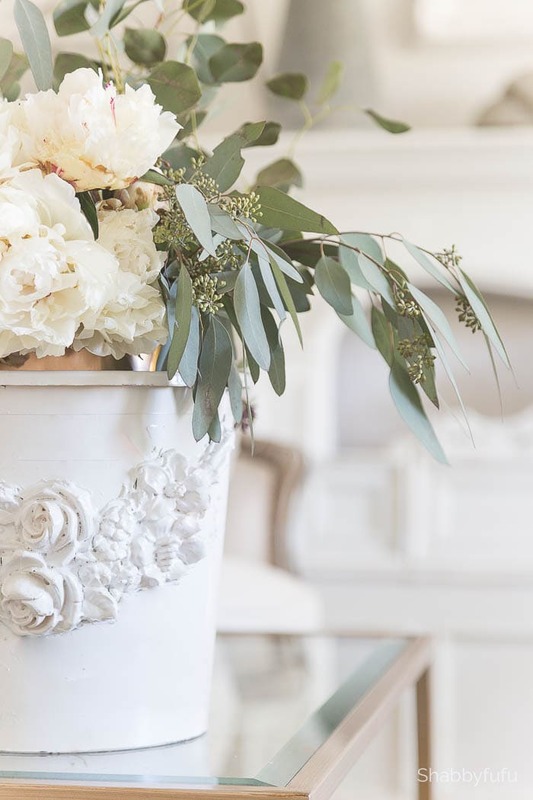 I’m going with a cotton ball runner I picked up on sale from Ballard Designs…I have a fabulous antique mirror leaning on the wall of the mantle…I’m thinking of hanging a matching cotton ball wreath on the mirror…we’ll see how it looks. Have a blessed day…I so enjoy your style. Hi Yvonne, Please contact me as I am interested in your interior curated services. Thanks. Just sent you an email, Lynette! What size are the stars in some of your mantle pictures? I love the way they look. I’ve collected three sizes one is about 15 inches, the next about 18 inches and the largest is probably 24 +inches. shelf side being too “ heavy. Any ideas? HI Diane, depending on the size of your tv I might let it stand alone. You certainly don’t want to fank it with paintings.TV’S are just a fact of life now. I’d leave it alone. The mantel was custom built for our home. A good contractor can probably replicate it. Your mantel ideas make mine look minimal. I need to do some more layering. My mantel is long but not very wide so I have to see what fits. I have used some of your ideas and like them. 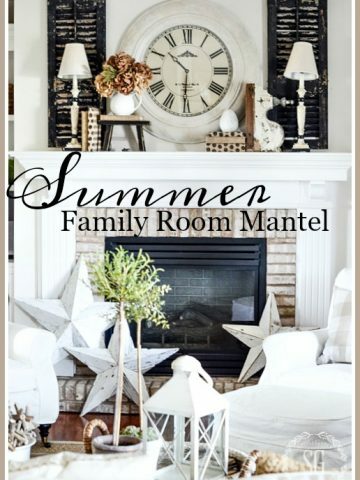 love your mantel ideas…don’t have one to decorate…wish I did when I see your mantel posts! If you have a shelf, or a small table use that to make a mantel effect in your home. Change it out with the Seasons; it will be a focal point for your room and some fun ……………. Love that you start with the advise that the mantel should reflect me and my style. But then it can get a bit fuzzy – do you collect some elements you want with and then just “work it” until it looks right (following your guidelines)? Would it help if I start with something I LOVE and plan the design around that? I usually start with lots of things and “play” until I get it right. Your mantel always looks great. I struggle with not having everything match on each end of the mantel. I’m going to try to go out of my comfort zone and do something different on each end. Thanks for all of your great advice. You want to strive for balance and not symmetry. It’s so much more interesting! How do you style a mantle with a TV over it? So glad you asked! Look for a post on that topic next week. I love the mantel ideas. Could you please tell me that it’s ok to have a hugh painted portrait over my mantel and what to add to it. I keep seeing NO matchy! Matchy! It’s hard not to balance on each end of the mantel. And I would hate to cover up a very expensive painting. Pictures would be great! I’ve looked on lots of sites and no help. I will post a picture of my mantel in the other comments. Large paintings are classic over a mantel. You don’t need much else. Maybe a couple groupings of candles. I think your oil painting would look lovely over your mantel. One thing to keep in mind is that the picture/ mirror should not be wider than the mantel itself. An option to hanging the picture is to place it right on top of your mantel with a slight lean. Now, your painting is part of your vignette. As far as styling, keep the rest simple. I always place three large pillar candle holders on one side and balance that with two/three substantial pieces on the other. 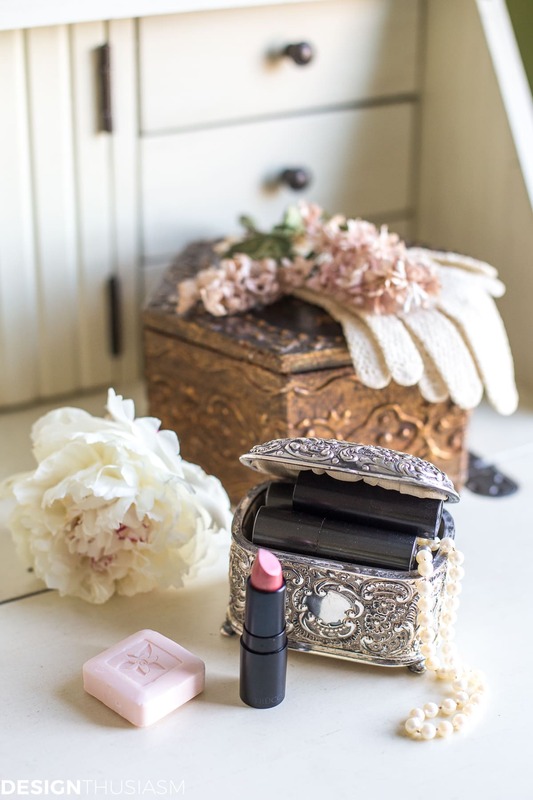 Small decorative items on your mantel present as clutter. Take your cue from the painting itself. Thank you for this post. The mantle in my living room is the bane of my existence. 15 feet long it hovers over a teeny tiny fireplace that has been closed off and it has a HUGE mirror over it that looks like it came straight out of a 70s mobile home. It is the focal point whether I want it to be or not and I have spent the last 10 years trying to make it look decent to no avail. I am going to empty it and try your tips 🙂 I rent my home and the mirror is glued in place sooo…I am thinking of covering that monstrosity with fabric that will blend into the wall. Do you think that would work? I’d cover that mirror with a rectangle of repurposed wood painted white. Clean slate! Great tips, and as always, I love your philosophy of going with what one loves, and not necessarily with what is trending. Right now, I’m looking at a pretty blank, narrow, white mantel with a large TV and sound bar centered above it. All Christmas decorations are down and I’m pondering how to decorate it. I’ve had pineapple lanterns flanking either side for quite some time. 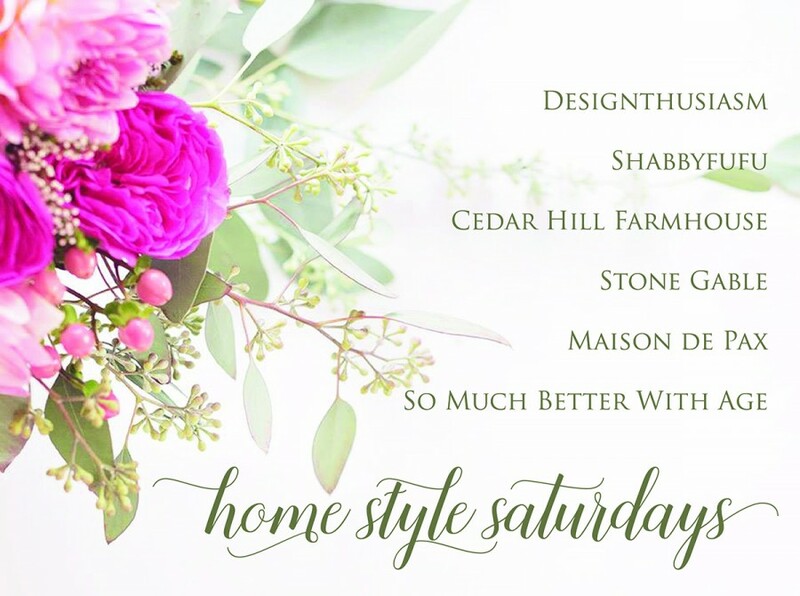 I’m thinking I should go “shopping” around our house for other accessories to change it out–maybe some Mercury class candlesticks, seeded eucalyptus…you have me thinking out loud! Great tips, but do you have any ideas for decorating a mantel that is a 90 degree corner mantel behind a wood stove with the pipe going up the middle? Anything tall that I put in the corner is behind the pipe. I never see anyone online addressing this issue and I’ve been fussing over it for years now. Thanks! Hi Shelley, I’d leave the pipe alone. It’s part of your wood stove. And I’d the mantel beside it. Just make sure each side is NOT matchy-matchy and make sure one side balances with the other. Hope this helps. Thank you so much, Yvonne! That does help. Love your style. 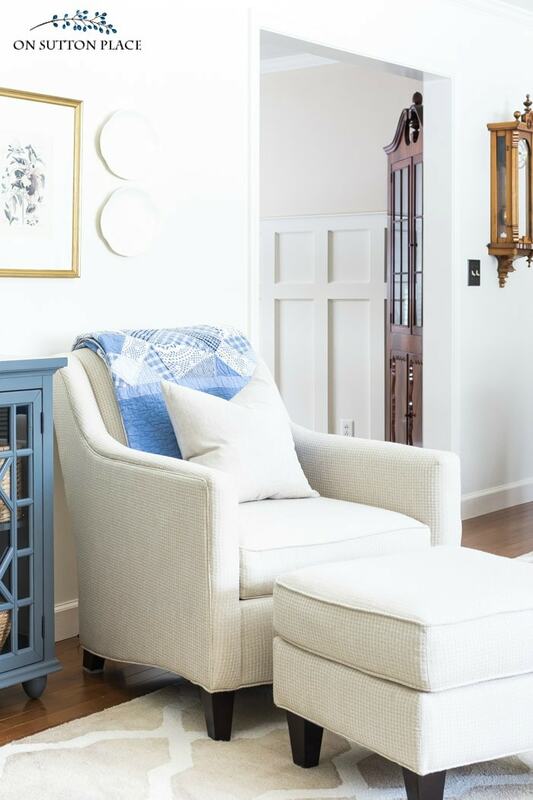 Great tips for styling mantles, Yvonne. You do a wonderful job at explaining the elements of design. Thanks and have a great weekend. 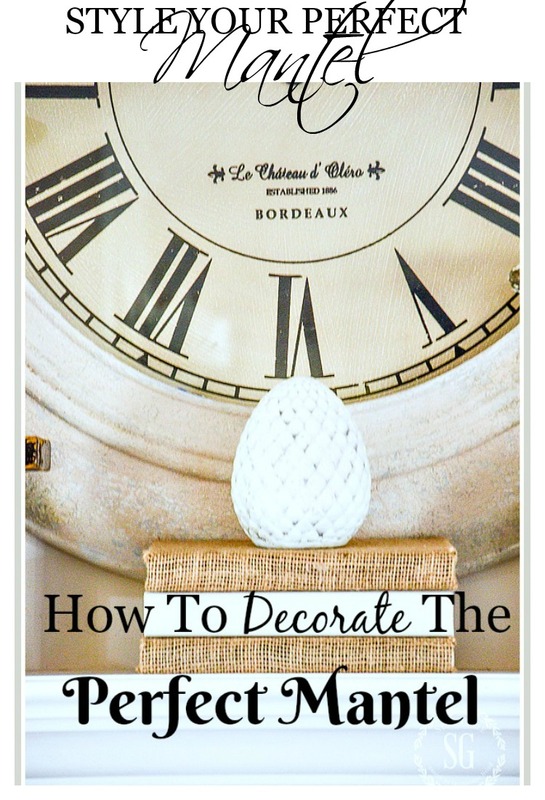 Wonderful tips….I’ll have to try it out on my mantel. Mine is difficult – long and set too high. Too much brick. I struggle with making it look good. Eventually I want to redo it but for now these tips will hopefully help me make the best of it. Cecilia my mantel is high and narrow too! Have you thought about painting the brick? I bet that will change the entire look of your mantel. Thanks so much, Yvonne! Since I live in South Florida we don’t have a fireplace. I don’t have a mantel. We have a big entertainment center that is my husband’s from his first marriage. Therefore, there is quite a bit of space to fill up! I just figured out what I need to do up there from reading this post! Thank you so much for illustration. It really helped me visualize how I can better fill up the space. Blessings! Thanks Yvonne! I really needed this tutorial! I get stuck when it comes to my mantle. As I was reading your post I was looking at my mantle thinking “oh boy, I need help!” I will certainly give my mantle some more thought this cold snowy weekend ! Your suggestions are appreciated! Yvonne, Thank you for your tutorial on mantles. After the holidays I find it a little challenging. 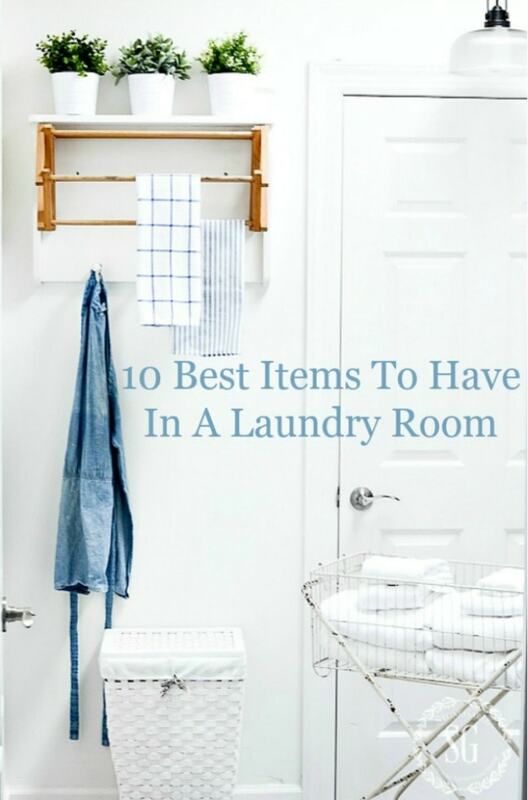 What I would like to add is I have found that sitting in a different place in the room gives me another view of the mantle and helps me decide what I need to take away and where I need to place something. Almost like taking pictures.